Summary: They were the original power couple - outlandishly rich, impossibly attractive, and endlessly fascinating. Now, in this rare, behind-the-scenes portrait of the Kennedys in their final year together, #1 New York Times bestselling biographer Christopher Andersen shows us a side of JFK and Jackie that we've never seen before. Tender, intimate, complex, and at times, explosive, theirs is a love story unlike any other - filled with secrets, scandals, and bombshells that could never be fully revealed until now. -Simon and Schuster, 2013. In my continued fascination with Jackie Kennedy (this will not be the last book you see about her or her husband from me this year), I picked this book up in Barnes & Noble two years ago. 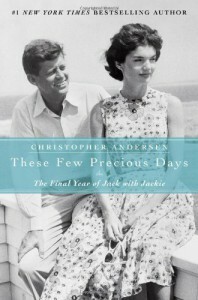 Though the subtitle is "The Final Year of Jack and Jackie", the book does cover their entire marriage, only briefly discussing the youth of both JFK and Jackie. It's truly a wonderfully written book and I enjoyed reading it. I would recommend it to both someone who knows next to nothing about the Kennedys and someone who knows a good amount about them. Since a lot of the material is taken from primary sources, you're really getting an intimate look at the couple, but only so intimate as JFK and Jackie allowed. The book's analysis of JFK and Jackie not only gives the reader a deeper understanding of them, but of what it means to be human - to possess admirable traits as well as disappointing flaws. It was a true pleasure to read. The only fault I would give it is that it tends to repeat the same stories, points, or quotes throughout chapters. It made me start to think Andersen was trying to fill pages. Other than that, the book was great. I give These Precious Days an A+. Please support the author by either buying the book or by borrowing it from a friend or your local library. Thanks for reading!